Frank Gardner shared results from the Concord Christmas Bird Count. The area encompassed by the count includes sections of Bedford. 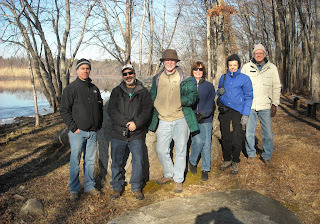 We had a good outing for the Concord Christmas Bird Count - Bedford Sector. Dale & Janice Landis, Barbara Centola, Rob Dobson, Andy Clerkin, and I were all able to participate. We had a total of 29 species and 509 individual birds tallied for the day. Highlights for Bedford included new all-time highs of 30 mallards (thanks to all the open water), 18 downy woodpeckers, 3 northern flickers, and 27 white-breasted nuthatches. We also added one new first-time species for the Bedford Sector - 2 swamp sparrows! The really exciting thing about this species is that it was seen in the restored wetland area behind the Pulte development (Hartwell Farms) off of Hartwell Road. As recently as last year this area was part of an old abandoned parking lot and now it is a nice-looking wetland!